Read the following analysis of the Steel - Twilight Zone episode written on the ScreenAnarchy website. It's the real Real Steel, the episode written by Richard Matheson that inspired the recent big-budget motion picture, with Lee Marvin starring as a badass promoter of a robot boxer. The Plot: Boxing promoter Sam 'Steel' Kelly trundles his robot fighter from town to town, even though it's an outdated model that's on its last spring. 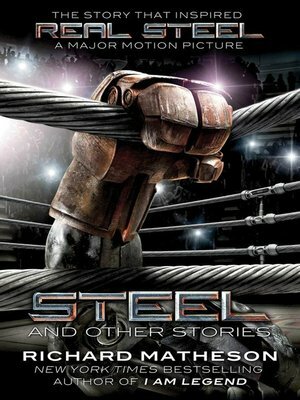 When that spring finally breaks after Steel has hustled up a fight for the robot, mechanic Pole (Joe Mantell) sagely advises Steel to give up, but Steel will not be deterred -- they need the money. So he decides to step into the ring and take on a robot boxer who's much more powerful than he is. The Goods: In 1963, Cassius Clay was still rising through the ranks, aiming at the crown worn by Sonny Liston. which Clay would take from him the following February to become the heavyweight champion of the world; Clay later changed his name to Muhammad Ali. We remember Ali, but we forget that 10 boxers died from the sport in 1963, including featherweight champion Davy Moore; the previous year, welterweight champion Benny "Kid" Paret, whose fight was televised live, died a week after suffering severe injuries in the ring. Calls to ban boxing were rising, and so it was not so far-fetched for writer Richard Matheson to conjure up this "what if?" scenario, based on his own 1956 short story, in which boxing was banned in 1968. As written by Matheson and directed by Don Weis, man's blood lust has not been slaked by 1974, when the episode is set. The fans are just as rabid, and just as likely to boo robots as they were humans. Lee Marvin has tremendous presence as the desperate boxing promoter who ends up stepping into the ring to face an overpowering opponent. But, as good as Marvin is, Mantell matches him as his mechanic; in his face and voice are reflected the stress and anxiety that drives Marvin to take such drastic action. The Trivia: As with the season's first episode, "Steel" featured two TZ acting veterans. Lee Marvin played a haunted lawman in the Season 3 Western "The Grave," and Joe Mantell essayed a small-time criminal in the Season 2 episode "Nervous Man in a Four Dollar Room." On the Next Episode: The classic tale of a man recovering from a nervous breakdown who is convinced that he sees a gremlin on the wing of a passenger jet, 20,000 feet in the air! We're running through all 156 of the original Twilight Zone episodes, and we're not doing it alone! Our friends at Film School Rejects have entered the Zone as well, only on alternating weeks. So definitely tune in over at FSR and feel free to also follow along on Twitter accounts @ScreenAnarhcy and @rejectnation.